Bringing any Star Wars creature to life on the big screen is a bit of a challenge, but you might think that bringing back legacy characters such as Chewbacca might be a little bit easier thanks to their already being previous work to work off of. Speaking at Star Wars Celebration, creature designer Neal Scanlan discussed the myriad challenges to bringing Chewbacca back for Disney and Lucasfilm’s new series of Star Wars movies. The way the team ended up with Chewbacca’s new movie look took ideas, plenty of perseverance, and honestly, a whole lot of luck. But don’t take it from me. Here’s what Neal Scanlan revealed. So the first thing about Chewie that we realized was that if you were George Lucas and you created this character called Chewbacca, what you really want is for someone to walk through your door who’s 7 foot plus, has incredibly wideset, beautiful eyes and a very strong jawline. How lucky was that for George when Peter Mayhew walked through the door? Obviously, Joonas Suotamo (who is allegedly 6’ 11”) was signed on for the role and that particular problem was worked out for the design team. However, there was a bigger issue at the heart of creating Chewbacca—they didn’t have any of the original plans or molds for the character. 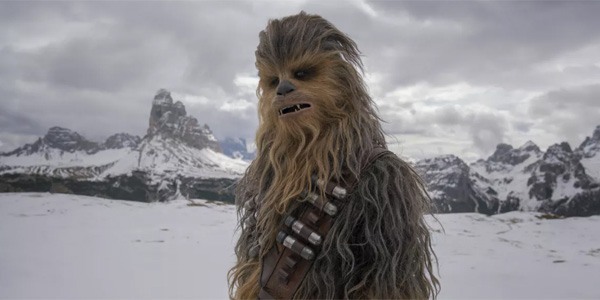 Neal Scanlan said at Star Wars Celebration 2019 that he and his team were confident they could get Chewbacca’s look close to that of the original trilogy movies, which came out between 1977 and 1983. However, he and his team quickly found out the process was “hopeless” and they were never going to get a fully accurate look for the character. Then almost at the point where we just tried to give up, I had a sculptures working. We were trying to reverse engineer: What does Chewie look like underneath? A colleague of mine walked in, he said, ‘I have something for you.’ I thought he’d probably brought me a can of beer or something. He said, ‘I have an original cast of Chewbacca’s head.’ I was like, ‘You’re kidding me!’ He was like, ‘No, I did a little bit of work experience with Stuart Freeborn and he gave me a cast of Chewie’s head. So, they went from having a lot of trouble trying to figuring out exactly how to nod to the past to having Chewbacca’s full facial look in the blink of an eye. Scanlan also noted about that particular bit of luck that it was one a great day for himself and his team. That day was an amazing day for us because it literally allowed us to then go ahead and make Chewie with a likeness knowing that likeness was exactly like what Stuart Freeborn created. The second thing was the original Chewie suit was knitted by Stuart Freeborn’s wife. She actually knitted it! I said to [my team], ‘This is insane. We can’t knit the suit.’ But actually what we realized was she didn’t knit it because that was the only way they could do it, she knitted it because that was the perfect way to do it. Because [there’s] something about the way a wooly jumper moves and a wooly jumper stretches. On interior sets there might not be any real airflow and the hairs would just trap all the heat to the fur and cause a slow temperature rise. While filming I would perform my bit and we would go again many times – usually this would take from an hour to 2 hours. On scenes requiring 3 hours I would sometimes need to start conserving my energy. There are always tough puzzles doing creature work. We learned during the release of Star Wars: The Last Jedi that there were over 180 creatures created for that movie — a number of large magnitude. In general, Star Wars movies are large scale productions. The flicks not only create actual, fully formed creatures but often construct sets rather than relying on CGI to make the films come across as realistically as possible. It’s not just Chewbacca that has been fully formed for the new movies. Neal Scanlan also talked more about the sea cows which had to be transported by helicopter to come to life this weekend, so the attention to detail given to this franchise is really unparalleled. With that in mind, it’s not shocking to now know each Chewbacca suit took six months to come together. Still, if you’re wanting to get into some legit Chewbacca cosplay, you have quite the challenge ahead of you. But if you’re happy to admire Chewie from afar, you can catch the creature designed character back in action when Star Wars Episode IX hits theaters this December. To take a look at what else we know about Star Wars: The Rise of Skywalker, check out CinemaBlend’s full guide.